While CellarTracker is primarily aimed at consumers, there are several dozen restaurants who use the site to manage their wine lists. A number of restaurant-specific features have been added to enable this. If you are a restaurant and are looking to use CellarTracker, contact us to have the restaurant functionality enabled for your account. CellarTracker allows you to easily generate public pricing for a wine list by setting multiples based on thresholds (which are determined by the maximum cost you have paid for a wine). The idea is to give the sommelier an easy way to price things without having to manually keep track of this for thousands of different wines. 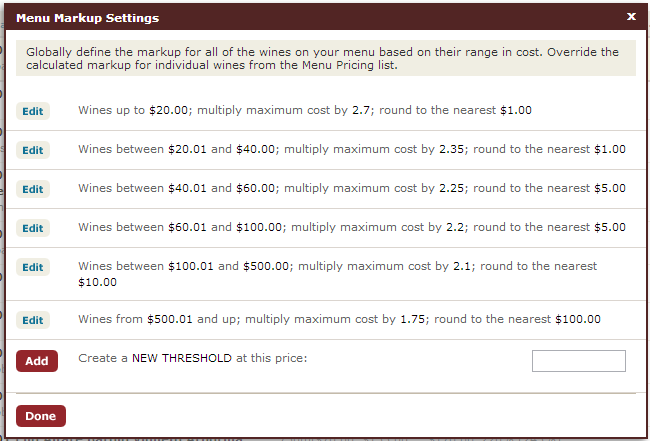 Or, if you reorder a wine at a higher price, you would presumably want your list price to reflect that automatically. The system also allows you to tag specific bottles sizes of specific wines with a pricing override. The site already allowed consumers to generate restaurant style wine lists in a variety of formats; for restaurants, these have been extended to include ‘public’ prices. Here is the list for the Pluckemin Inn (a restaurant in New Jersey) both formatted traditionally or by varietal. And to make things simpler for their customers, they have a simplified top 100 list as well as a simple by the glass list . The amazing thing here is that this list is utterly up to date. The Sommelier takes the point of sale output each night and scratches it from his inventory. And the moment he does that their website is up to date. He also uses the site to generate his printed wine lists. We have partnered with www.VinoPad.com who offers an iPad-based restaurant solution that is powered by CellarTracker. Please contact them for more information. The barcodes can be used at the time the bottle is removed from the cellar to automatically reduce the inventory. Or when doing a physical inventory of the cellar, these barcodes can be scanned into the website to call up a wine so that the number in stock can be verified.